The Mount Salem player who missed a crucial penalty for his school controls the ball despite a close watch being received from his Flanker opponent during their quarter final round match played at the Mount Salem Community field. Flanker won the game 1-0 to move through to the semi-finals set for Monday March 26. For the second time of asking, Flanker booked their ticket to the semi-finals of the Noel King Under-12 Primary Schools Football Competition with a thrilling 1-0 quarter final round victory over Mount Salem at that school’s community field on Friday. 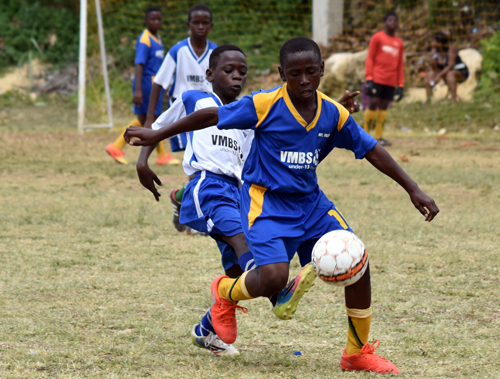 In what was a replayed game, following the infractions of the opening clash, Flanker, were again the better of the two and achieved the same result, a vital win, in booking their spot to the March 26 semi-final date with in-form Barracks Road Primary. Troy Moore scored the all-important goal from the penalty spot for the Flanker team, netting from 12 yards out on the stroke of the halftime break. Mount Salem had only themselves to blame as they too had the chance to get on the scoresheet, but their penalty was sensationally saved by the Flanker goalkeeper mere minutes before they fell behind. The match had to be replayed after the first showdown was deemed null and void for Flanker’s use of 12-players for almost the entire first half of the first quarter final match. Flanker had also won that match by a 3-2 margin. Meanwhile, defending champions Corinaldi against Granville, in what is a repeat of last year’s championship game, is the other semi-final. The final is set for Wednesday, March 28. WILL THEY STAND ASIDE WHILE ANOTHER PLAYER IS BLACKBALLED BY THE NFL?